Elements 2013 - Crossing Boundaries! Our latest production with 1300+ audience - a sold out show, yet again! Perceptions 2012 - Anubhavam Pudhumai! 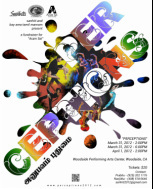 Our critically acclaimed 8th Annual production with 1300+ audience - a sold out show 10 days before! Funds raised for Aram Sei, a non-profit organization - $25,000!